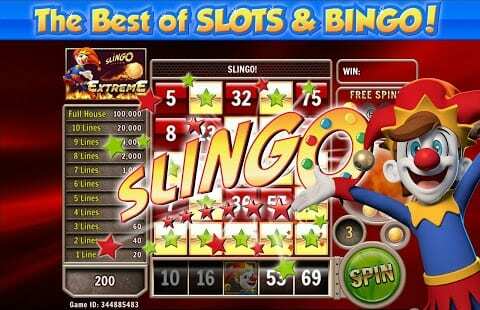 Slingo is then brand new combination instant game a superb cross between slots and bingo. Give it a try. A superb new bingo themed slots game produced by the ever-growing Gaming Realms most known for their production of Spin Gene which has proved to be a huge hit and went global with several gambles around Europe. This had since prompted Gaming Realms to consider the idea of developing a unique to their own online casino game. Well, good news my friends it has happened, and they’ve called it. Slingo! Yeah, I know what you’re thinking. What a name! well, that’s just the standard type of brilliance that emerges every so often from the team at Gaming Realms. If the title of the game has already got you on the edge of your seat, then you better brace yourselves as this combination of slots and bingo is a one of a kind game for all of you who are passionate about not only slot games in general but bingo as well. Slingo offers you the premium package, providing players with titles from two of the biggest gaming operators around in NetEnt and Microgaming accompanied with some other fantastic Gaming Realms creations. The game itself is unmissable a combination of our favorite games in one with brilliant bonuses to boot. Gaming Realms is an online games developer that specializes in delivering next-generation, mobile gaming content. They are one of the fastest growing gaming companies in the industry, with more than 60% year-on-year revenue growth in 2016. They also won one of the coveted places listed by the London Stock Exchange Group as one of the 1000 Companies to Inspire Britain in 2016. In addition to Slingo, they produce other bingo, slots and casual games for the social gaming market. You can discover more about other Gaming Realms games here. The hard-fought decision for Gaming Realms to launch an online casino of their own is one that has paid off. In a market where a gap is nearly impossible to locate due to the significant rivalry of other top online casinos, Gaming Realms have now gained that experience in helping them develop in this new direction with a stable product in Slingo, that has been grabbing online gamers with its charming idea that, so many punters just can’t refuse. Gaming Realms are a rapidly growing developer in the iGaming world and have proven repeatedly how talented they are justifying this through the exceptional content in their games. Slingo is just another one on the timeline from these magnificent developers. Slingo is a unique concept that marries bingo and slot machines together. Some people prefer the deliberately slow pace of a bingo game as they enjoy the social element along with the potential for winning the jackpot. Others enjoy the fast-paced played, constant action entertainment you get from a slot machine. These two games seem very different from one another but they are both classic casino game that is near and dear to many gamblers. With two options so close to the heart, why not combine the two? That’s exactly what Gaming Realms did in 2016, the result is Slingo! Not only do you have the familiar bingo-based offerings, such as watching one ball drop at a time, marking off the number from your card, you’ve also got the spin element which adds to the excitement. Throw in Wilds, limited decision making, loads of variations for themes, and you have a winner! What you have here is a combination of the classic fruit-machine style action and bingo gameplay, producing something unique in the iGaming world. The object of the Slingo games are simple, you have a 5x5 grid and you want to make as many line combinations as possible as every five-in-a-row combination will earn you a prize. The more lines you make, the more cash you take home, and of course a full house is what gets you the jackpot. A Slingo board looks like a typical 75-ball bingo layout, each column has five numbers drawn from a different set. the first round contains numbers in the 1-15 range, the second has numbers from 16-30, and so on down the line. Winning lines can be made vertically, horizontally, or diagonally. You can also choose whatever stakes suit you best, for example Slingo Riches offers bets from 50p up to £100. Slingo is still new, but already there are a wide range of variations on the original concept. You can pick between lots of different themes that change the gameplay in a variety of different ways. Play Big Money Slingo, which randomises different prizes for each potential line win. Deal or No Deal Slingo offers classic gameplay missed in with the game show elements in which random boxes hold different prize amounts, and the banker might make you an offer for a box you’ve set aside. There are other titles based on some of Britain’s favourite television programmes like Britain’s Got Talen and X Factor Slingo, which offer their own highly entertaining performances to watch while you gamble. You get the sense that Slingo isn’t just hanging around for the short term, a product created by a developer that grows quicker than hair. Is sure to be a sign that this great creation of a game has the backing to maintain itself in the industry as it has been crafted by one of the up and coming teams right now, so the future is bright. Be part of this revolution of Slingo and challenge yourself at this simple but effective combination of games, win prizes and gain bonuses and fall in love with this slots and bingo craze. If you’re tired of the same-old-same-old slot machine and bingo games, Slingo is an exciting variation that will certainly become a favourite. The gameplay is simple and straightforward, even when you play a new variation. The betting range is adaptable which will attract every level of player, which means that anyone can get in on the action of this exciting new concept. Giving you no excuse to not play this fresh new game idea that is sure to contribute to a gameplay shift in the online casino world. We personally are huge fans of this game, a chance to explore something new that could possibly become the sole reason you wake up in the morning (okay maybe not that far) however you will never know the truth of this game unless you try it!